Over the course of the SENRAN KAGURA series so far, we’ve seen the characters grow in meaningful ways. They’ve become more self-confident, gained greater respect for both friends and foes, and made progress in working through their troubles. So what’s it like going back to the beginning of all that? To answer that, first we need to go back to the development of the original Burst. We’ve talked about this a few times before, but the original game was written as a standalone story, without any sequels in mind. In terms of back story and basic worldbuilding, Burst is perhaps the most in-depth out of any game in the series. But in terms of the characters’ arcs, it’s a bit out of sync with the later games; at one point, for example, Yagyū tells Hibari that she’s perfectly capable and just needs more confidence, while other games, particularly in the early series, have Yagyū doubting Hibari’s capabilities until circumstances force Hibari to prove herself. In other cases, the original game’s translation leads to some out-of-sync moments. Yagyū, while fighting off Hebijo girls to save Hibari, narrates, “I kill, and kill, and kill again.” Other than that one line, the series has never directly stated that the girls are actually killing their opponents — and some lines, particularly in Deep Crimson, emphasize that they’re going out of their way not to at certain points — so we revisited that line, checked the original Japanese, and found that the word translated as “kill” was more accurately translated as simply “slash.” “I slash, and slash, and slash again” is the way that line reads in Burst Re:Newal. Then there’s the new text, new material written for Burst Re:Newal specifically. By exploring the game’s full 3D environments and seeking out all the hidden corners (some of which hide secret, extra-tough bosses), players can find new “Top Secret Files.” There are dozens of those files, each one giving a peek at a new facet of the shinobi world. You’ll find receipts for the girls’ online purchases, classified dossiers and guidelines from the shinobi higher-ups, ads for training dummies, and more. My personal favorite file, and this is a minor spoiler, is a transcript of the interview Ikaruga’s adopted father gave on TV, the one where he enraged Yomi by saying Japanese poor people were better off than most poor people in the world. You can see where he’s wrong (and why Yomi would be upset), but you can also see where someone in his position might say that, so all in all, it’s a nice bit of character building for both of them. Speaking of new text, what I enjoyed the most about working on Burst Re:Newal was writing for the two new DLC scenarios, which focus on Yumi and Miyabi before they met the Hanzō and Hebijo girls. 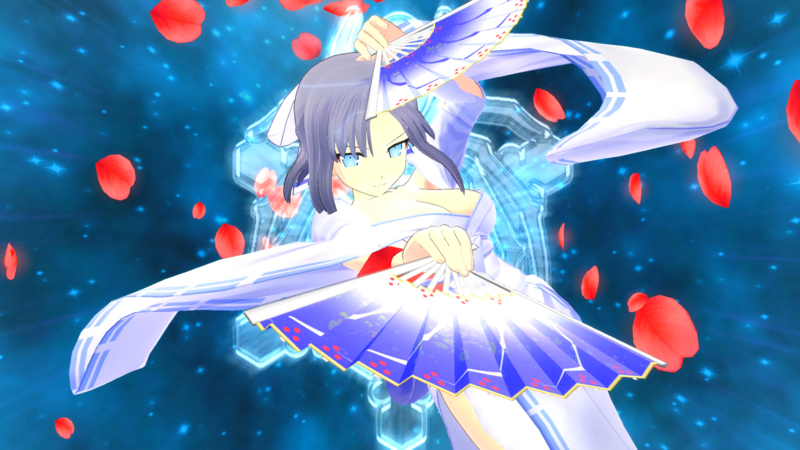 Yumi’s story hearkens back to the Gessen girls’ early days as seen in Shinovi Versus, when they were militant paladins out to protect the innocent and punish the guilty to the fullest extreme. In her Burst Re:Newal story, we see Yumi’s ideals clash with the nuance and ambiguity of the real world, possibly for the first time, and end up with several insightful discussions on the nature of law and crime as it relates to good and evil. Miyabi’s story, which covers her drive to succeed at Hebijo and avenge her mother at any cost, is deeply character-driven, and goes to show precisely what “at any cost” really means for her. For series fans, both scenarios also let you play through certain pivotal moments that past games have only hinted at. In terms of both substance and production values, they’re the two most robust DLC items the series has ever had. It’s been quite a journey to bring Burst Re:Newal to the finish line, but we’re proud to have it done, and we hope everyone enjoys the new visuals, combat mechanics, exploration, and story material! For more info, check out http://skburstrenewal.com/.